Little Howlin Wolf on Maxwell St.
Little Howlin Wolf also recorded an LP, "Little Wolf Sings The Blues" (Blues Factory Production-Chicago, IL), over twenty-five years ago. The LP was produced by Willie Dixon and he also wrote the cover notes. Musicians appearing on the LP were: Freddy Dixon, Lafeyett Leak, Billy Branch referred to as "young with plenty of potential", Buster Benton, Clifton James, Dennis Miller, Johnnie B. and Koko Taylor. Little Wolf and Bobby Rush have been friends for about thirty years. Rush was also good friends with the late Howlin' Wolf for about thirty five years before he passed away in 1976. One day Little Wolf and Rush were just talking about old times Bobby Rush asked Little Wolf "How about recording an album?" Little Wolf jumped up and said" Why not, I would love it." It was about noon that day when Bobby said lets cut some songs today!" Little Wolf said later "I was shocked it happened so quickly" " The next thing I knew he was calling musicians up to play in the studio. Five or six hours later we were recording. It happened just like that. God must have put it together. This album is great and I think it is the best I've done in my life." "Cryin' For My Baby" was produced and arranged by Bobby Rush for Rush Up Productions. 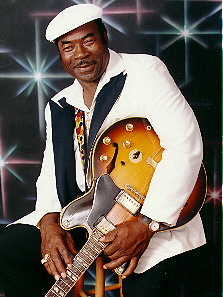 The title cut of the CD "Cryin' For My Baby" and "Going to New Orleans" were written by Bobby Rush.